The Lord spoke unto them saying, "I will ask you each a simple question. If you tell the truth I will allow you into heaven, but if you lie....Hell is waiting for you. To the first man the Lord asked, "How many times did you cheat on your wife?" The first man replied, "Lord, I was a good husband. I never cheated on my wife." The Lord replied, "Very good! Not only will I allow you in, but for being faithful to your wife I will give you a huge mansion and a limo for your transportation. 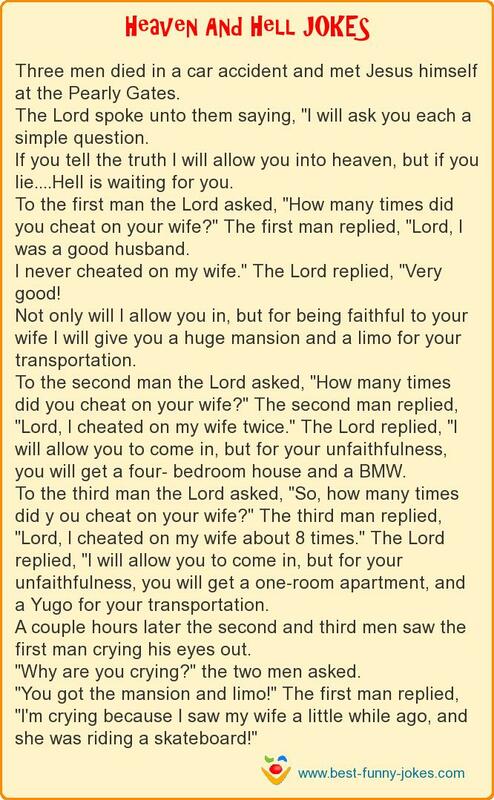 To the third man the Lord asked, "So, how many times did y ou cheat on your wife?" The third man replied, "Lord, I cheated on my wife about 8 times." The Lord replied, "I will allow you to come in, but for your unfaithfulness, you will get a one-room apartment, and a Yugo for your transportation. "Why are you crying?" the two men asked. "You got the mansion and limo!" The first man replied, "I'm crying because I saw my wife a little while ago, and she was riding a skateboard!"